A Critical Exposition of the Popular "Jihad"
Showing That All The Wars Of Mohammad Were Defensive; And That Aggressive War, Or Compulsory Conversion, Is Not Allowed In The Quran. Author of: "Reforms under Moslem Rule," "Hyderabad (Deccan) Under Sir Salar Jung"
Calcutta: Thacker, Spink And Co. 1885. Calcutta: Printed By Thacker, Spink And Co. I here take the opportunity of removing a wrong idea of the alleged injunction of the Prophet against our countrymen the Hindús. The Hon'ble Raja Sivá Prasad, in his speech at the Legislative Council, on the 9th March, 1883, while discussing the Ilbert Bill, quoted from Amir Khusro's _Tarikh Alái_ that, "Ala-ud-dín Khilji once sent for a Quází, and asked him what was written in the Code of Muhammadin law regarding the Hindús. These alleged injunctions, I need not say here, after what I have stated in various places of this book regarding intolerance, and compulsory conversion, are merely false imputations. There are no such injunctions of the Prophet against either _Zimmis_, (_i.e._, protected or guaranteed) or the Hindús. This Book Is, Without Even Asking Permission. 1. 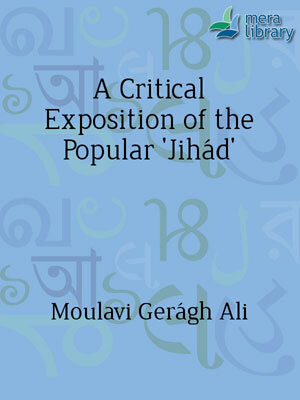 In publishing this work, my chief object is to remove the general and erroneous impression from the minds of European and Christian writers regarding Islam, that Mohammad waged wars of conquest, extirpation, as well as of proselytizing against the Quraish, other Arab tribes, the Jews, and Christians; that he held the Koran in one hand and the scimitar in the other, and compelled people to believe in his mission. I have endeavoured in this book, I believe on sufficient grounds, to show that neither the wars of Mohammad were offensive, nor did he in any way use force or compulsion in the matter of belief. 2. All the wars of Mohammad were defensive. He and those who took interest in his cause were severely oppressed at intervals, and were in a sort of general persecution at Mecca at the hands of the ungodly and fierce Quraish. Those who were weak and without protection had to leave their city, and twice fly to the Christian land of Abyssinia, pursued by the wrathful Quraish, but in vain. Those who remained at Mecca were subject to all sorts of indignities, malignity and a deprivation of all religious and social liberty, because they had forsaken the inferior deities of the Quraish, and believed in the only ONE GOD of Mohammad, in whose mission they had full belief. Mohammad and his followers had every sanction, under the natural and international law, then and there to wage war against their persecutors with the object of removing the (_Fitnah_) persecution and obtaining their civil rights of freedom and religious liberty in their native city. 3. The fierce persecutions renewed by the Quraish at the time of the expulsion of the Moslems from Mecca were acts of hostility tantamount to a declaration of war. From that time commenced the state of war between the parties. In the Arab society at Mecca there was neither an organized Government, nor any distinction between a public and private person and property. There was no regular army in the State, and what existed was not a permanently organized body, so provided with external marks that it could be readily identified. The form of Government at Mecca was patriarchal, and the chiefs of the Quraish and the citizens of Medina themselves constituted an army when occasion arose. Therefore, since the commencement of hostilities or the state of war, every individual of the Quraish or the Meccans was a public enemy of the Moslems, and liable to be treated as such in his person and property, except those who were unable to take part in the hostilities, or, as a matter of fact, abstained from engaging in them. Therefore it was lawful for the Moslems to threaten or to waylay the caravans of the enemy, which passed to and from Mecca close to Medina, and also to attack the Quraish at Mecca, if they could possibly do so. 4. But as the people amongst whom the Prophet and his fugitive Moslems now sojourned had only pledged to defend them at Medina, the flying Muhammadans could not take up arms against their aggressors, the Quraish, to defend their rights of religious liberty and citizenship, much less of taking arms to compel the non-believers to believe in Moslem faith, and so they preferred to live in peace at Medina, and enjoy the blessings of their new religion without any disturbance from without, if possible. 5. In fact, the Moslems, after suffering so long such heavy persecutions at Mecca, had at length got an asylum of peace at Medina, where they had very little desire left to entertain any idea of commencing hostilities or undergoing once more the horrors of war, and were too glad to live in peace after their last escape. The people of Medina had only agreed to defend the Prophet from attack, not to join him in any aggressive steps towards the Quraish. The attention of Mohammad and his followers who had fled with him was mainly occupied in preaching and teaching the tenets of Islam, in establishing a fraternity between the refugees and the citizens, in building a house for prayer, in providing houses for refugees, in contracting treaties of neutrality with the Jews of Medina and other surrounding tribes, Bani Zamra (a tribe connected with Mecca) and also with Bani Mudlij (a tribe of Kinana related to the Quraish), in anticipation of the impending danger from the Quraish, who had pursued them on the similar occasions before, and in organizing, above all these, some of the religious and civil institutions for the Moslems, who were now fast assuming the position of an independent society or commonwealth. Under such circumstances, it was next to impossible for Mohammad or his adherents to think of anything like an offensive war with their inveterate foes, or to take up arms for proselytizing purposes. It was in the second year from the general expulsion of the Moslems from Mecca that the Quraish, with a large army of one thousand strong, marched upon the Moslems at Medina. Medina being 250 miles or 12 stages from Mecca, the aggressive army, after marching 8 stages, arrived at Badr, which is 3 or 4 stages from Medina. Muhammad--with only 300 Moslems, more being from among the people of Medina than the refugees--came out of Medina in self-defence to encounter the Quraish, and the famous battle of Badr was fought only at thirty miles from Medina. There could be no doubt that the affair was purely and admittedly a defensive one. Sura XXII, verses 39-42, copied at page 17 of this book, was first published in the matter of taking up arms in self-defence after the battle of Badr. 7. The Quraish carried on three aggressive battles against the Moslems at Medina. The first, called the Battle of Badr, took place at thirty miles from Medina, the Quraish having come down 250 miles from Mecca. The second, called the Battle of Ohad, was fought at a distance of one mile from Medina, the enemy having advanced 250 miles from Mecca. The third was the battle of confederates, in which they had mustered an army of ten thousand strong. The city was besieged for several days, and the Moslems defended themselves within the walls of Medina which they had entrenched. These were the only battles between the Quraish and Mohammad, in each the latter always acted on the defensive. Neither had he attacked the Quraish offensively to take revenge, nor to compel them by force of arms to accept his religion. Even these three battles were not waged by Mohammad to redress wrong or establish imperilled rights. They were only to repel force by right of self-defence. Had Mohammad and his Moslems invaded Mecca and fought battles against the Quraish there, he would have been justified for waging war to redress the injuries of person and property inflicted by the Meccans on the Moslems whom they were tormenting for their religion and had expelled them from their homes, and had even barred their yearly visitation to the shrine of Kaába. A war which is undertaken for just causes, to repel or avert wrongful force, or to establish a right, is sanctioned by every law, religious, moral or political. 8. Sir W. Muir, the great advocate for the aggressive Quraish, holds that the war of Badr was "brought on by Mahomet himself," and that he intended to surprise the caravan of the Quraish returning from Syria under the charge of Abu Sofian, and had come out to Medina to waylay it. Abu Sofian sent for an army of the Quraish for his aid, and thus commenced the battle of Badr. I have given my reasons at pages 74-76 of the book to show that this is a false account. I will not point out from contemporary records, _i.e._, the Koran, that Mohammad meant, nor had he come out of Medina, to attack the caravan. I. The verses 5 and 6 of Sura VIII  show that a part of the believers were quite averse to Mohammad's coming out of Medina on the occasion of the battle of Badr. Had their mission been one of plundering rich caravans, as it is generally alleged, there could be no reason for that aversion of a party of believers who are accused so often of a hostile attitude towards the Quraish, and possessed of that great love of booty and adventure so prominent among the Arabs. The fact is, a party of believers had disputed with Mohammad the necessity of the combat and its probable result outside Medina. They preferred to defend themselves within its walls. This argument is against the allegation that Mohammad with his followers had started to waylay the caravan, and the Quraish had come only to rescue it. II. The 43rd verse of the same Sura shows that it was by a mere accident or coincidence that all the three parties of the Moslems, the Quraishite army and the caravan had arrived, and encamped close to Badr in front of each other. This is an argument against those who say that Mohammad had intentionally come to Badr to waylay the caravan there. There was, in fact, no predetermination on the part of Mohammad either to waylay the caravan, or encounter the Quraish army at Badr. Mohammad with his followers had come out only to check the advancing enemy in his self-defence. III. The seventh  verse of the same Sura shows that while the parties had so accidentally encamped close to each other, the Moslems had desired then and there only to attack the caravan, as a reprisal or by way of retaliation, instead of combating with the Quraish army. This is an argument in support of my contention that there was no previous arrangement to attack the caravan. IV. The same verse also shows that Mohammad had no intention of attacking the caravan either before his coming out of Medina, as it is alleged by ignorant people, or after coming at Badr in front of the enemy's army. V. Sura VIII, verse 72, which treats of the prisoners of the war taken at Badr, expressly notes the treachery of the Meccans before their being taken prisoner, and refers obviously to their aggressively setting out of Mecca to attack the Moslems at Medina. VI. Sura IX, verse 13, at a subsequent event of the violation of the truce of Hodeibia by the Quraish, very distinctly charges them with attacking first and waging offensive war and being aggressive. As there was no war or attack from the Quraish on the Moslems before Badr, I conclude that in the war of Badr the Quraish were aggressive. [Footnote 5: 5. "_Remember_ how thy Lord caused thee to go forth from thy home on _a mission_ of truth, and verily a part of the believers were quite averse to it." 9. But Mohammad, harassed and attacked every year by the Quraish and other hostile Arab tribes, had hardly any time to wage an aggressive war against his Quraishite foes, to establish his imperilled rights, or to redress the injuries of the Moslems or his own wrong; much less of taking up arms to compel them to renounce idolatry and believe in his Divine mission. During the first year after their expulsion from Mecca, the Moslems were in constant danger from the ferocity of the Quraish, and when Mohammad was contracting treaties of neutrality with the neighbouring tribes, Kurz-bin-Jábir, a Quraish of the desert, committed a raid upon Medina. In the course of the second year the Quraish fought the battle of Badr, followed by a petty inroad of theirs upon Medina at the end of the year. The Bani Nazeer treasoned against Medina by giving intelligence to, and entertaining, the enemy. In the beginning of the third year, the nomad tribes of Suleim and Ghatafán, inhabitants of the plains of Najd, and descendants of a stock common with the Quraish, twice projected a plundering attack upon Medina. At the same time the Moslems were defeated at the battle of Ohad, near Medina, by the Quraish, which circumstance greatly affected the prestige of the Prophet, who was threatened with a similar fate the next year by his victorious enemies. With the opening of the fourth year, the inimical spirit of many of the Bedouins, as well as that of the Jews of Bani Nazeer, was perceptible, and in various quarters large masses were organized to act against Mohammad and to take advantage of the defeat at Medina. The tribes of Bani Asad and Bani Lahyán were brought together to follow the victory of the Quraish at Ohad. And last, not least, the Moslem missionaries were cut to pieces at Ráji and Bir Máuna. At the close of the year, the people of Medina were alarmed by an exaggerated account of the preparations at Mecca to attack Medina as promised last year (Sura III, v. 176). During the fifth year certain tribes of Ghatafán were assembling with suspicious purposes at Zat-al-Rikaa and the marauding bands near Dumatal Jandal threatened a raid upon Medina. The Bani Mustalik, a branch of Khozaa, hitherto friendly to Mohammad's cause, took up arms with a view of joining the Quraish in the intended attack upon Medina. At the end of the year, the Quraish, joined by an immense force of the Bedouin tribes, marched against Medina, and laid siege to it for many days. The Bani Koreiza, having defected from Mohammad, joined the Quraish army when Medina was besieged. In the beginning of the sixth year Uyeina, the chief of the Bani Fezárá, had committed an inroad upon Medina. A Medinite caravan, under the charge of Zeid-bin-Háris, was seized and plundered by the Bani Fezárá. In the month of Zul-Kada, (the eleventh month of the Arab lunar year), when war was unlawful throughout Arabia, but much more so within the sacred precincts of Mecca, Mohammad and his followers, longing to visit the house of their Lord and the sacred places around it, and to join the yearly pilgrimage which they had grown from their childhood to regard as an essential part of their social and religious life, not to mention their intense desire of seeing their houses and families from which they were unjustly expelled, started from Medina for performing the lesser pilgrimage. They were under the impression that, in the peaceful habits of pilgrims, the Quraish would be morally bound by every pledge of national faith to leave them unmolested, and Mohammad had promised them a peaceful entry. But the Quraish armed themselves and opposed the progress of the Moslems towards Mecca, notwithstanding the pious object and unwarlike attitude of the pilgrims. At length a treaty, in terms unfavourable to the Moslems, but in fact a victory won by Islam, was concluded by Mohammad and the Quraish at Hodeibia. By this peace war was suspended for ten years. Let us be exemplers of peace, reconciliation, fairness and justice. When the world calls us "Jihadis" in order to show their disapproval of us, should we continue to dwell on the subject of "Jihad" as if it is a synonym for Islam? If Muslims cannot avoid mentioning Jaddo-Jehad (struggle) they must struggle against the defamation of Islam. They must struggle against the branding that is being done about Islam. That struggle must be something like, if you try to project me bad, I'll prove you wrong by being good. Today the issue is not about who is right and who is wrong. May be one day Muslims would be able to prove that they were not wrong, always, but proving that, that too in future will not solve their immediate problem. The immediate problem is that their image is getting tarnished and their reputation is at stake and they must struggle, do the jaddo-jehad, to save their reputation and restore their image. There was a time, not long back, in villages in India, where an old Muslim man would be invited to settle dispute among even non-Muslims because it was believed that he would not lie as he happened to be pious man. Where is that level of confidence and trust in you from your non-Muslim neighbours and villagemen. You have lost it not because non-Muslims have become communal as you say, but because you are no more pious. Do not compare yourself with your grandfather and great grandfather. See what you are. Jihad should be reduced to a one sentence small print footnote in our discourses on Islam. If Muslims do not focus on contemporary issues of reform, education, human rights and gender equality they will continue to sink. Please upload the complete book. It answers 90% of the points that are debated in this forum. This book will help avoid unnecessary and much repeated debates on the same subject.